Dr. D. B. Pahalajani: In most of the guidelines diuretics are preferred as the first drug you know to be used in patients. They are in the NICE guidelines or all the guidelines coming from abroad. I have my own doubts on this, doubts in the sense apprehension. I do not say doubts, I have my own apprehension. See these are all trials which have been looked at from the temperate zones, that is, the colder climates, whereas ours is really humid climate in most of the places, very warm climate and therefore I feel we loose lot of water, we loose lot of sodium from the perspiration, and therefore my feeling is, this is what I see in my clinical practice. I have no papers on this hypertension, maybe you all guys are better equipped with more scientific material. This is what I see in my clinic. I see lot of patient developing hyponatremia and getting very severely asthenic. They cannot tolerate diuretics for a long time. Ultimately, I have to withdraw diuretics and then put them even on the sodium, so I think perhaps you should look at the papers, which comes out from these countries and see whether the diuretics should be the ideal one for our country. Dr. Siddharth Shah: A very important question which was discussed at length by all the five members of the core committee as far as Indian Guidelines are concerned. That is the reason why the Indian Guidelines have come into being. Because, we did not say that we are innovating anything from the JNC-7 or the British Hypertension Guidelines or the Canadian Guideline, but our country is very unique. It has from temperate zone where there is too much heat and in some places there is humidity, other places there is no humidity, so it will depend on which part of the country you are. In very hot climates, there is a lot of dehydration and these patients if you give them diuretics they are at the worse. So, this was considered and that is why you will see in our guidelines that in young patients we have still preferred that ACE inhibitors and we have not mentioned about diuretics. This is the precisely the reason why we want the diuretics, but mind you, diuretics is of very good agent for combination with a primary drugs and which we cannot do without because most of the antihypertensive that we see do not get under control with one drug and also consider the cost effectiveness of the diuretics, I think it is one of very beautiful drug for combination. This was agreed upon by all the committee members as far as the guidelines are concerned and that is why I feel the diuretics has a place, but one has to be careful about what you said the the side effects of the drugs also. Dr. D. B. Pahalajani: Is there any Indian data available on this? Dr. Siddharth Shah: No there is no Indian data. Dr. D. B. Pahalajani: So that means this is just we are extrapolating? Dr. Siddharth Shah: Extrapolating what we see. The core committee members were from different parts of the country, east, west, north, south, and the central part, so each one had its own experience. Professor Sethi would you like to comment on this? Dr. Kamal K. Sethi: I agree with both of you actually to some extent. Most of us probably tend to use a nondiuretic as a first line, but often times it is not possible to control blood pressure with a single drug. In fact, the kind of patients that we see in the hospitals are virtually never controlled with a single drug. Maybe they come to us only when they are uncontrolled or they have other comorbid conditions like coronary disease, heart failure, or other things and there of course the choice of diuretic with heart failure is totally different, but as far as hypertension is concerned, perhaps most of us would not be using diuretic as first line therapy except in the elderly individuals where diuretics are particularly effective and the angiotensin converting enzymes inhibitors or ARBs or beta blockers are less effective, I would not say they are ineffective. Because of obvious physiological changes that take place in the elderly, they loose renin activity and therefore the effect changes. Calcium blockers similarly are more effective in the elderly as compared to younger people, not that they are not effective in others, so one has to actually choose the drug combination depending upon the clinical situation. There are many who are unable to tolerate the diuretics, there is no doubt about that. In that situation, obviously one has to make the appropriate tailoring to the therapy. Dr. N. Sivakadaksham: One comment about diuretic is: Professor Masasarelli was once giving a lecture in the American Physician Association and he said I am hypertensive, how many of you are, please raise the hands. 75% of the people raised their hands, physicians and he said how many of you take diuretics? Not one. When you do not take diuretics for yourselves, how are you justified in prescribing one, he asked. This has been quoted in his book. The second thing is about beta blocker, as Dr. Pancholia was telling the most important is I think we have to create a slogan A is not B, atenolol is not a beta blocker. There is a common advertisement that we see on TV channels. The mother will be making a sweet in the house, the father will return from the office and asked what is the celebration? She says your son has won a prize in running race. Then the father will ask which place, she says second place. Then how many people ran, he asked. She says two people. So, this is like you want to compare a drug which is metabolically not a very good beta blocker. Any person who wants to instead of using a placebo they select atenolol and most of the trials that said beta-blocker should not be used have taken atenolol for convenience and compared it with ACE inhibitor and calcium channel blocker. This is one aspect of it. While giving lectures on hypertension, I call some of the company people and ask them to find out the sales of each drug in this country, in India. Do you know which is selling the maximum? The combination of atenolol with amlodipine is number one and second is atenolol, third is amlodipine single, and fourth alone is diuretics and ACE inhibitor. Even today, till 2011, I got the data which says atenolol-amlodipine combination is the largest selling because of its effect and because of its cost probably. So, with all this in mind, but we have to as scientific persons, we have to take in to account that we will have to shun. Because even now I see lot of cardiac patients being written pioglitazone, that does not mean we should continue to use it. We should learn from our mistakes and we should avoid using and start using beautiful, wonderful beta-blockers not atenolol. Question from audience: As far as the lifestyle modification is concerned, salt restriction is aggressively indicated, I agree, but when ACE inhibitors and ARBs are used, they are not very aggressively indicating the salt restriction, and if we do the salt restriction as such it produces hyponatremia and they will end up, should we still insist salt restriction or just ask them to take normal? The question is, when you are using ACE inhibitors or ARBs do you emphasis on salt restrictions or not? Dr. N. Sivakadaksham: To all our hypertensive patients first thing that we do say is salt restriction and lifestyle modification. Luckily none of them stick on to that and therefore we do not say specifically take normal salt when you prescribe ACE inhibitors. Because today society is mostly hi-fi and most of them eat outside. Eating outside means added salt for better taste. So, we do not say, but as I had projected in the slide you can give it even in normal salt intake people and it works better ACE inhibitors and ARBs. Dr. Siddharth Shah: A word of caution over here is that whenever we give ACE inhibitor or ARBs, try to see that the patient does not get dehydrated. 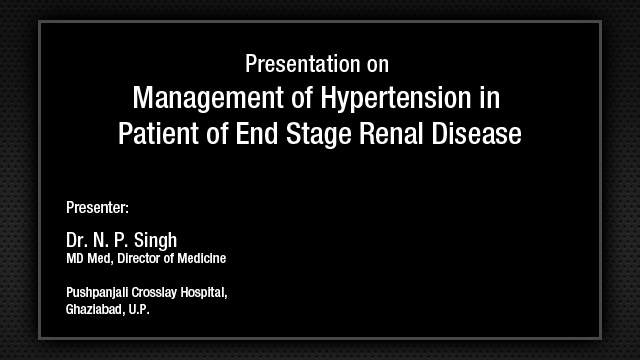 If the patient is dehydrated with ACE inhibitors or ARBs you are going to face major problem of hypotension and sometimes renal dysfunction also, so one has to be very careful especially when the patient is going for surgery. If you keep for long hours without any fluids or any things and they get dehydrated and then you have complications. So just a work of caution, when you use ACE inhibitors or ARBs be careful they are not dehydrated. Dr. D. B. Pahalajani: I think, Dr. Siddharth has made a very good point. You see as a matter of fact, patients who go for coronary bypass graft surgery and they have been on ACE inhibitors or ARB, our recommendation is to take off ACE inhibitors and ARBs for at least three to four days. As he says it cause volume depletion and some of them may get into hypotension, which may be volume related and therefore the mortality in the mega trials have shown the patients who have been on ACE inhibitors or ARBs had higher mortality following coronary artery bypass graft. So it’s a very, very important point, this I am saying in relation to CABG, but as he says I am sure it must be relevant to other surgeries also. Dr. A. K. Pancholia: Sir, what about beta-blockers, preoperative? Dr. D. B. Pahalajani: Yes, also there is a data on that, that if you have patients who are on beta-blockers, if the patient is going for elective sugary then stop them for 24 to 48 hours. Dr. A. K. Pancholia: But it is to be restarted soon for prevention of postop atrial fibrillation? Dr. D. B. Pahalajani: Right, yes. As a matter of fact there is a data that instead of giving them beta blockers you give them the Cordarone also. Dr. A. K. Pancholia: And higher dose statin. Dr. D. B. Pahalajani: Right. Question from audience : Sir, one point of observation for Dr. Sivakadaksham. In your talk you did mentioned about all cause mortality being reduced to 30% by perindopril. However this molecule has never come in to the forefront? Your observation on that and the second part which I did want to understand is, in a diabetic renal failure what level of creatinine values or the estimated GFRs would you think would need the point of cut off to hold back your ARBs or ACE inhibitors. Dr. N. Sivakadaksham: The role of ARBs and ACE inhibitors in chronic renal failure, I think we are having a talk about, that but as a clinician what we do is if the patient has got like Sir projected, 1.4 creatinine or 2 creatinine, the advise that is given today is most of the ACE inhibitors and ARB can cause an initial slight increase in creatinine, but do not get afraid, continue to use them, but if there is doubling of the creatinine within 8 weeks of usage, please stop using it. Originally, the nephrologist used to say when ACE inhibitors were introduced if the creatinine is more than 2.5 do not use ACE inhibitor and ARB. Today, they are using it even when the creatinine is more, but if there is sudden doubling within 8 weeks they stop using ARBs and ACE inhibitors. Before writing this lecture, I called one of the nephrologist and asked him the incidence of renal artery stenosis in isolated transplanted kidney, that is, single kidney with renal artery stenosis is higher than in a normal population because it is an arthrosclerotic disease, you are doing an anastomosis, it is going to be more, do you still use ACE inhibitors and ARBs. He says we use in plenty. Only thing is we use the same caution as I have told you before. If there is a doubling of creatinine within 8 weeks we immediately stop it. Dr. N. Sivakadaksham: If it has been induced by the drug, it should come down. Dr. Prashant Rajput: Actually, the recommendation for use of ACE inhibitors and ARBs in patients with chronic kidney disease, you can use it any point of time but the essential thing is if you are using an ACE inhibitor or ARB check a creatinine after 3 days, 5 days, 7 days, 10 days, a month. If there is no worsening of GFR or increase in creatinine by more than 25%, continue to use it. If there is worsening of GFR by more than 25% please stop it. Because the hemodynamic effects of ACE inhibitors and ARBs they are evident maximally by 10 days, and if the creatinine goes up please stop them immediately otherwise you will end up with permanent loss of kidney function. We cannot wait for eight weeks. Dr. A. K. Pancholia: To check the potassium is important or to check creatinine is important? Dr. Prashant Rajput: Both. Especially, when you have a proteinuric renal disease, if the proteinuria is significant even the creatinine is 4. Our aim is to retard the progression and if you are able to reduce the hemodynamic effects by angiotensin by blocking the angiotensin receptors and if your potassium is reasonable you can still continue it provided the GFR does not drop by more than 25%. If it drops, please stop. Question from audience: Just continuation with that. you know, there were patients who had reasonably stable renal functions, they have been well controlled on their hypertension, and you keep looking at the serum creatinine, they hovers around 1.5, 1.6, 1.7, suddenly, they shoot up to 2.4. Are we missing out something here, or are we not assessing our patients on just serum creatinine. If we were to do either evaluation with DTPA or GFR evaluation, would that be more effective than just looking at serum creatinine level. 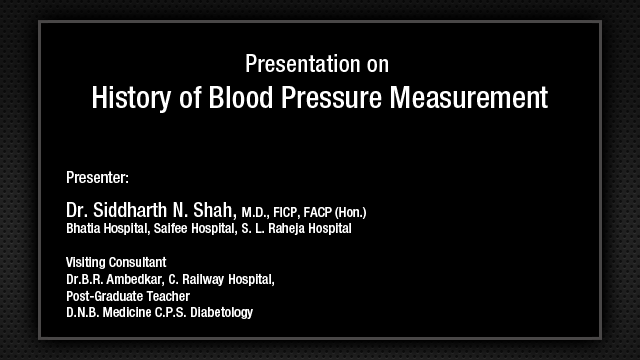 Dr. Prashant Rajput: It is unreasonable, because in my talk you would see what are the bad effects of ACE and ARBs. Question from audience: Sir, you have mentioned in the Indian Hypertension Guidelines, the use of beta blockers at a younger age. Indians genetically, they are more prone for IGT, diabetes mellitus, and using for a long period exposure of beta blockers at a younger age with a family history of diabetes or the things, does it lead to higher incidence of diabetes, dyslipidemia, so whether it is an ideal drug for a long term use for an young individual, beta blocker? 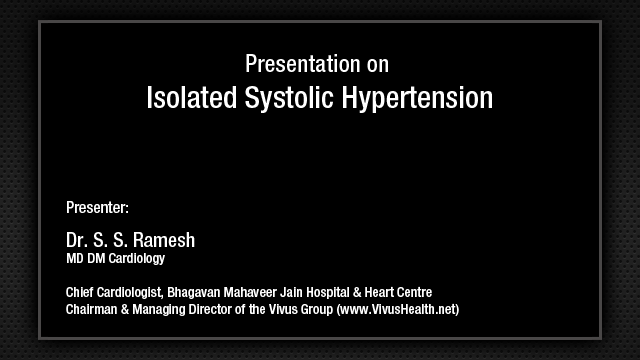 Dr. A. K. Pancholia: As I mentioned in my slide, the young obese, hypertensive diabetic patients they have more sympathetic activity and that is responsible for more insulin resistance and in that situation, the highly selective beta blocker, particularly bisoprolol, could be very effective and it has been shown by the stalwarts in the field of this beta blockers and all. Comment from Dr. Shah on this issue. Dr. R. K. Sahay: So I think we can end on the note that we need to retire atenolol and look forward towards the newer beta blockers and use them in the indications where they are required without having the fear while continuing to use the ACE inhibitors and ARBs.